The 9000-00 is the standard model and is designed to fill cylinders to one pressure setting. Pressure settings are pre-set at the factory and adjustment in the field, when necessary, is simple and straightforward. When filling cylinders, the unit pumps until the desired, pre-set air pressure is met and then shuts off automatically. This eliminates any guesswork in determining when the cylinder is full. Typical settings are 2216 psi or 4500 psi. The 9000-A2 model maintains the same proven performance as the 9000-00 model with the added features of two pressure settings and auto starting. Changing between filling pressures only involves the turn of a valve handle. For example, after filling a cylinder, the operator conveniently turns a knob one-half turn to fill a cylinder of a different pressure. No tools are needed and both settings are pre-set at the factory. This eliminates the guesswork involved in filling the different pressure-rated bottles and there is also no fear of overfills because both circuits have a "vent to atmosphere" safety relief valve. Whether in the field or at the station, alternating between 2216 & 4500 psi cylinders is easy. The 12000-00, which is designed to fill cylinders to 6000 psi, enables fire stations with 5000 psi compressors to recharge 6000 psi cascade storage tanks. 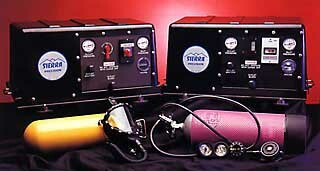 The 12000-A2 model allows the user to recharge storage bottles AND also fill SCBA cylinders. Typical settings for the A2 are 4500 psi and 6000 psi and switching between pressure settings only requires the turn of a valve handle. ith the 9000 A-2 and 12000 A-2 automatic on/off switching, the booster will pump until the maximum pressure setting is reached, then will automatically shut off. After the valve is closed, the full cylinders can be replaced with empty cylinders. Re-opening of the valve will send a low pressure signal to the booster which will automatically start pumping and repeat the cycle.